but it's handy for the moment, as basically we're starting from scratch again. I love it). Still, "IGL" sounded great to me. I must knuckle down and give those late BB albums a serious listen some time. "Transcendental Meditation". And it makes perfect sense what they say! Thanks for this, listening right now! together, while Bruce and Carl repeatedly sing rounds of the same melody". One of my favourites from Surf's up! I recall watching footage of a live version from the Boys in the '70s, quite rare and on YouTube some years back now. I wonder if it's still online...Probably not, lol! Cool Cool Water wrote: One of my favourites from Surf's up! I recall watching footage of a live version from the Boys in the '70s, quite rare and on YouTube some years back now. I wonder if it's still online...Probably not, lol! Not a bad live version. Thanks for sharing, John! Bookmarked for the read this week. However, here's the classic on subject! 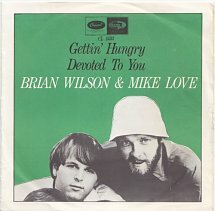 "Gettin' Hungry" is one of those rare pop songs whose verse is ad libitum and the chorus a tempo. The only other I can think of is Stevie Wonder's "If You Really Love Me". All further suggestions welcome. Is my memory correct, or did the record label get it wrong and believe Carl was Brian? Or was the front sleeve a pic of the whole band? Cool Cool Water wrote: Is my memory correct, or did the record label get it wrong and believe Carl was Brian? Or was the front sleeve a pic of the whole band? Oooff! You got me there. I'll have a look around tomorrow. Mr. K wrote: Oooff! You got me there. I'll have a look around tomorrow. Seems it's a Swedish pressing: http://www.45cat.com/record/cl15513se. Those Swedes are all the same--too much midnight sun and homemade alcohol, lol (jk). Mr. K wrote: Those Swedes are all the same--too much midnight sun and homemade alcohol, lol (jk).